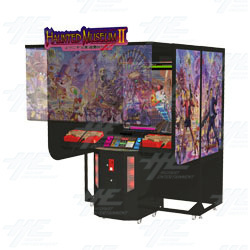 Haunted Museum 2 is a 1-2 Player light gun shooting game from Taito. It is the sequel to Haunted Museum and is known as Frightmareland in North America. The game revolves around two special agents who are investigating the disappearance of 100 people in a nameless city. Their investigation leads them to Frightmareland, a dilapidated amusement park where they believe the victims are being held captive by a group of crazy carnival characters. The game features 15 selectable levels, 1 bonus level, 12 mini-game missions, 6 bosses and three different game endings. The main enemies that players will face are killer clowns. Players will also come across barrels, boxes and objects that can be destroyed to reveal point bonuses, ammo and hostages. The game revolves around two special agents who are investigating the disappearance of 100 people in a nameless city. Their investigation leads them to Frightmareland, a dilapidated amusement park where they believe the victims are being held captive by a group of crazy carnival characters. The game features 15 selectable levels, 1 bonus level, 12 mini-game missions, 6 bosses and three different game endings. The main enemies that players will face are killer clowns. Players will also come across barrels, boxes and objects that can be destroyed to reveal point bonuses, ammo and hostages. Haunted Museum is a light gun shooting game from Taito. The game is based around the concept of objects in a museum coming to life, with players blasting through a range of varied environments and different enemies including medieval knights, sharks, and a giant boss made up of hundred of small toys.